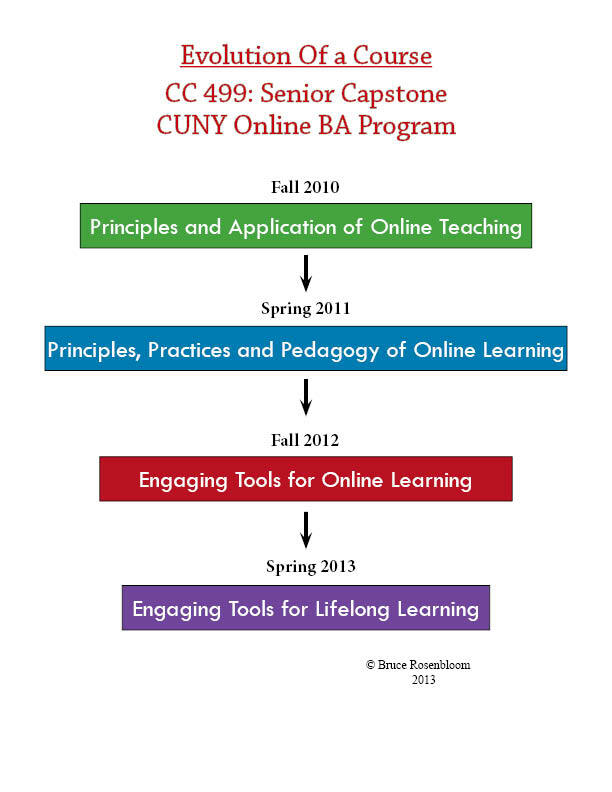 I have been fortunate to teach a capstone course for the CUNY Online B.A. program. Capstone courses in many programs are the culmination of work toward a B.A. degree, taught in small classes. Students are asked to produce a project that demonstrates mastery of the subject matter and requisite skills needed to obtain the degree. For an instructor, such capstones are valued not only for the small class size where you have an opportunity to interact more with students, but also, because the instructor has discretion over the course content which may be covered in greater depth. I have been teaching the capstone course for the Communications and Culture B.A. program for over three years during which time the course has evolved with my understanding of pedagogy along with my interest in the field. The various titles of the course reflect changes in my thinking, interests and understanding. Not surprisingly, these changes have paralleled shifts in my blog’s focus– from strictly online teaching issues, to issues of technology tools and online learning, and further to tools for engaging students in lifelong learning. The reasons for this “evolution” in my course are the subject of this blog post. The first course, “Principles and Applications of Online Teaching” was proposed and taught in Fall 2010. Given my interest in the field of online learning, I had a epiphany: Why not teach a course about online learning to students taking a fully online program? The course was traditionally structured with readings from Michael Simonson’s book about distance education, supplemented with my Camtasia screen captures and website resources. A great deal of the work was accomplished via online discussions about topics concerning online teaching and learning as well as trends in online education. An ending research term paper was also required. Overall, I thought the first incarnation was a success and generally felt the students were engaged and real learning was achieved. Upon reflecting on the first semester, I knew changes would be needed, hence the new title in the Spring 2011, “Principles, Practices and Pedagogy of Online Learning.” I believed that students needed to approach the subject matter–online learning–from multiple perspectives, namely, that of the student, the instructor, and the administrator. Those perspectives became the three course units that gave this revised course a real structure and focus. In addition to the change in content, I decided to experiment with several webinars throughout the course and also make use of anonymous surveys after each unit. Furthermore, I made group assignments a part of the course, and tied major assignments specifically to the three perspectives of online learning. Instead of a term paper, students had to produce and conduct an online learning module about an aspect of online learning. By the end of the term, I was pleased with the increased student engagement and tangible learning shown by the group projects and production of an online lesson. Student feedback was more positive than in the first term, with students mentioning the usefulness of the webinars and technologies used by the professor and themselves. I had the summer to contemplate further changes to the course, and by the Fall of 2012, “Engaging Tools for Online Learning” was rolled out. The focus had moved from the theory of online and the various perspectives, to the actual tools that could be used to enhance online learning. I was intrigued about the potential of Web 2.0 tools, social networking, collaborative tools, video/ screen capture and other technologies. So, theory had gradually given way to practice, and specifically the nuts and bolts production of online learning. It was no longer whether online had a legitimate place in the curriculum; by this time the battle was over. Online had achieved a strategic place in higher education pedagogy; it had entered the mainstream. To me, the question became, “How can we make online the best it can be?” Tools were central to this equation. I had all the students use a WordPress blog as the container of their semester’s work. I felt this gave them ownership of their work in a way that Blackboard discussions did not. Moreover, at the end of the semester, they had a tangible product of their efforts. I had the class explore a different tool almost each week, from screen capture and wikis, to word clouds and concept maps, from social networking to group collaboration tools. Each tool was used in a context, which required both an understanding of the tool in addition to the course content. I felt this approach was quite ambitious since most professors are happy for students to master some content, without even bothering to learn new tools. Nonetheless, despite some technical glitches, I felt the students’ comfort zones were stretched, and actual learning took place. My current iteration is called “Engaging Tools for Lifelong Learning.” As my thinking and understanding have evolved, I am starting to realize that learning begins and ends with the student. It’s not so much the mode of teaching (e.g. online or hybrid), or even the tools that facilitate that teaching, but rather it is the pedagogy that ultimately trumps technology. It was my recent reading of Tagg’s “The Learning Paradigm College” from which that insight came (see related blog post). Although I can’t single-handedly change the prevailing instructional paradigm, in my own small sphere of influence I can make the course focus more on actual student learning. This semester, I am still having students learn and use various technologies that they may incorporate in their real lives and beyond–as in lifelong learning. However, the passion for learning in all of us begins with our own personal passions and so I have students blog about their passions, interests and hobbies. The concept is that whatever passion they have (and presumably want to share with others) will energize them to learn these tools and apply them to teaching others. In addition, I have changed my focus from grading many individual assignments based on rubrics, to substantive feedback after each unit, via a teleconference/ discussion of a student’s work. I believe this will prove more useful than more frequent, but often superficial, feedback that most classes provide. Lastly, students will be connected via conferencing software to form groups that review and critique each other’s work. Naturally, the jury is still out on this semester (just starting), but I am hopeful. I think it is incumbent for teachers on all levels to improve, refine and tweak their courses throughout their tenure. Failure to do so constitutes “pedagogical malpractice” in my book. But even with all the changes I achieve as an individual instructor, I feel there is a chasm (more like an abyss) in the lack of fundamental change in our nations institutions of higher learning. The glacial (pre-global warming) pace of change in higher education prevents the real restructuring of teaching and learning until a later time. This entry was posted in A Learning Pedagogy, Instructional Technology, Online Best Practices. Bookmark the permalink.